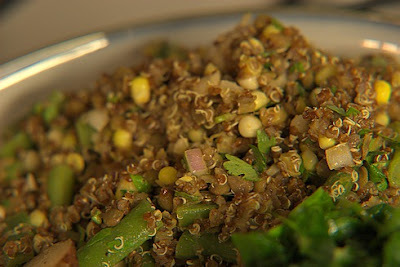 This salad came together in an effort to use up some red quinoa* and lentils that had been in the pantry for a while, as well as some green beans and corn that were still in the fridge at the end of the week. Andrew made the dressing, which was inspired by Mexican flavors. This is definitely a nutritionally balanced meal in itself, and the leftovers make great lunches. Unfortunately, since we created this dish ourselves, I can't write out a detailed recipe - neither of us is in the habit of measuring ingredients as we cook. So this will be a general description of the dish, with only very approximate amounts listed for the ingredients - sorry about that. I'll try to do this better in the future! *Quinoa is a grain-like seed that offers more protein than most other grains. Great for vegetarians who struggle with getting enough protein in their diets. All amounts listed here are very approximate. Because the quinoa and lentils expand quite a bit when cooked, we got dinner and several lunch portions out of this. Neither of us can really estimate the amounts of the dressing ingredients. I'd say about a 1:1 ratio of oil to lemon/lime juice is a good start. Spices and salt can be done to your taste - we went pretty heavy with the paprika, so that was the dominant flavor. You want enough dressing to lightly coat, not soak, the salad. Fill two pots (3 quart size or so) with water and bring to a boil. Place quinoa in a fine-mesh strainer and run water through it until water runs clear. When water is boiling, add quinoa to one pot and cook uncovered until quinoa is tender. The germ (white curled sproutlike thing) will come out of most of the seeds when they are close to done. When quinoa is finished, drain well and allow the grains to sit in strainer for 5 minutes before spreading onto a plate to cool. In the other pot, boil lentils until tender. Drain and cool. While quinoa and lentils are cooking, bring another large pot of water (sorry about the many pots involved here) to a boil. Add ears of corn and boil for 5 minutes. Remove corn (don't drain water), and run under cold water until cool enough to handle. While corn is cooling, add beans to boiling water in the same pot used to cook corn, cook for 5 minutes or until crisp-tender, drain and run under cold water to stop the cooking. Cut kernels off of corn. 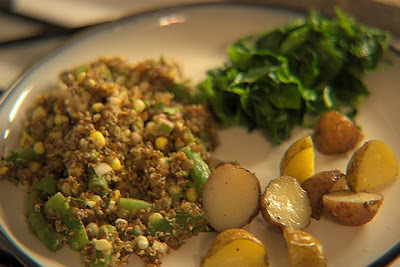 In a large bowl, mix together quinoa, lentils, corn, green beans and onions. Whisk dressing ingredients together until well mixed and then toss with salad. Top with cilantro and salt to taste.